Minding the transition of Summer into Fall is one of the lesser known, but very important things we can do to lay the foundation for our overall health and happiness throughput the year. The Ayurvedic premise– that our bodies are strongly affected by the environment— stems from the obvious but sometimes overlooked wisdom that the body and its processes are by definition an extension of nature. This means that when we observe overt or subtle environmental change we can assume those changes are affecting the internal workings of the body. As we observe the most marked aspect of autumn, the drying up and falling away of almost all surrounding summer greenery, we can know with total certainty that these same drying forces are at work in the body. According to Ayurveda (regarding this particular summer to fall transition), any dryness we may have accumulated from the summer heat is exacerbated by the drying winds of autumn. An accumulation or excess of dryness can show up in various systems of the body like skin, the digestive system, the mind. Dry skin, digestive issues, constipation, anxiety, or a feeling of being scattered are some symptoms commonly associated with this time of year. Since we are not culturally oriented to associate symptoms with the weather it can be hard for us to connect the dots between symptoms and seasonal change, but from an Ayurvedic point of view they are deeply related. While it is normal and expected to experience seasonal bodily changes, the tools of Ayurveda are there to keep us from going out of balance— helpful (and preventative) to those who feel mildly affected, invaluable to those who feel strongly affected. 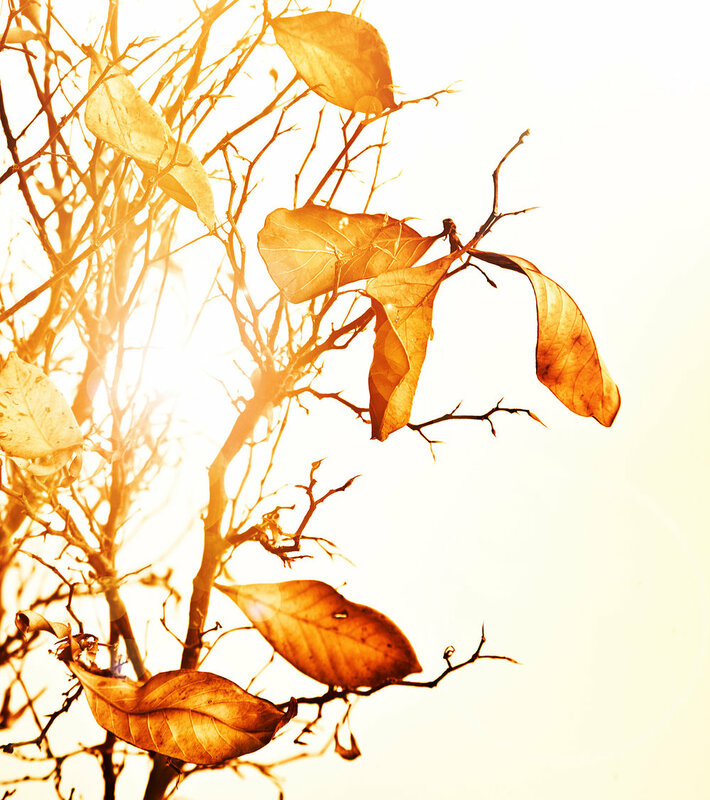 In Ayurveda the dryness and windiness of the autumn are considered to be aspects of the air element. The antidote to excessive air element is water element: Mid-August and through September, October, and November is therefore a great time to cultivate the water element and tend to deep hydration and lubrication of the tissues of the body through diet, herbs, and even lifestyle practices. It is an important time to build what’s called in Ayurveda the rasa dhatu. Rasa connotes the proverbial sap or juiciness in the body and essentially refers to the waters of the body in the form of lymph, plasma, and interstitial fluid. When the rasa dhatu is healthy and well-tended a person feels content, satiated, and fluid in their body and mind, and a healthy rasa dhatu ensures a smoother transition across the threshold from summer to fall and onward. Aside from staying hydrated, water element comes in the form of some of the heavier foods like nuts, high quality fats and oils, dairy, dates, avocados, high quality grains, and even small amounts of meat for non-vegetarians. A healthy rasa dhatu is not simply about consuming these foods but is very much about how we are digesting them. This is where the internal plumbing comes in– To what degree is our system able to transform water element into healthy rasa? To what degree is our system able to circulate water element throughout the body and carry it to the deeper tissues? Internal plumbing has to do with the quality of our digestion as it is influenced by any number of factors– the food we eat, how we use spices, our stress levels, the way we exercise, our unique constitutional tendencies, and more… Many of us need a little help in this department to ensure that water element is being circulated and absorbed. Autumn is a great time to make the inquiry into how the waters of your body are flowing! Leah Barr offers in-depth consultations for Ayurvedic work as well as guided cleanses.